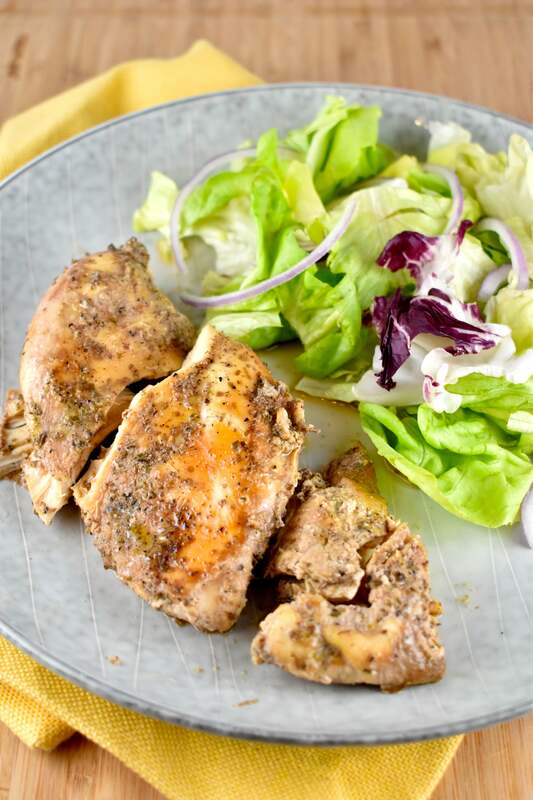 One of the most popular recipes on LaaLoosh is our Crockpot Beer Chicken. In 2012, it was named Ziplist’s most cooked recipe. And there is a reason. It’s wonderful and easy. It tastes great, is perfect for game days or a busy evening and is low in points. Chicken breasts are an incredible food. Nearly everyone likes them, they’re easy to prepare, they’re high in protein but relatively low in fat and you can use them in just about anything. They are mild and that means they are incredibly versatile. The downside of chicken is that, just like meatloaf, it’s just as easy to make tough and dry chicken as it is to make juicy and delicious chicken. The secret to this delicious and juicy chicken is really the beer. 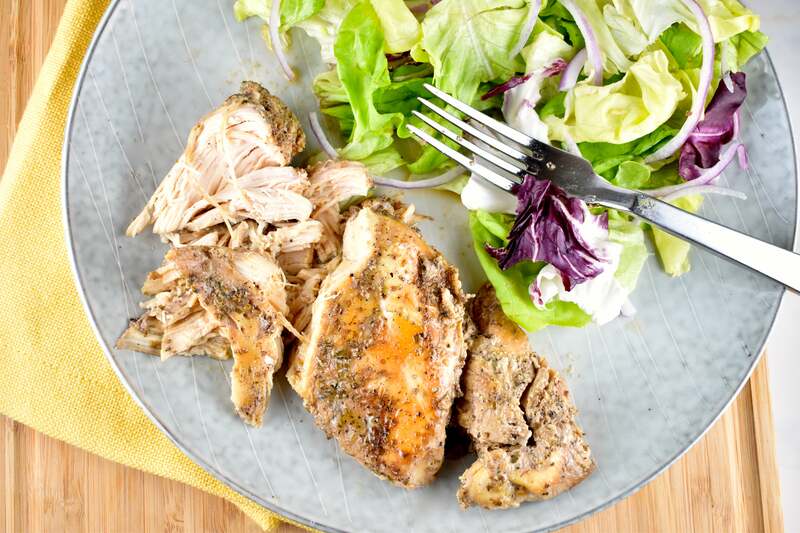 This Crock Pot Beer Chicken Recipe was named ZipList’s Most Cooked Recipe of 2012! People really seem to be divided into two camps when it comes to cooking with alcohol. There are those that avoid it like the plague and there are those that use it in every recipe that calls for it. I like to use alcohol in some recipes when it calls for it. It always seems to enhance the flavor of the dish. Beer’s essential role in this fabulous chicken comes down to the fact that alcohol can bind with both fat and water molecules. (Look at me getting all scientific!) That allows it to carry the flavor of the spices into the chicken and make the chicken incredibly flavorful. Add in a little alcohol, in this case dark beer, and you enhance the ability of the salt in the spices to penetrate the chicken breast. The result is more juicy and flavorful chicken. There’s frequently a concern that too much alcohol will be left in the dish and make everyone drunk. But that’s really not the case in many recipes. There simply isn’t enough alcohol in most recipes to have a measured effect on you. Not to mention the cooking method plays a major role in how much alcohol is left. Since this chicken is cooked in a crockpot for several hours, about 95% of the alcohol will be cooked out of this chicken before you serve it. 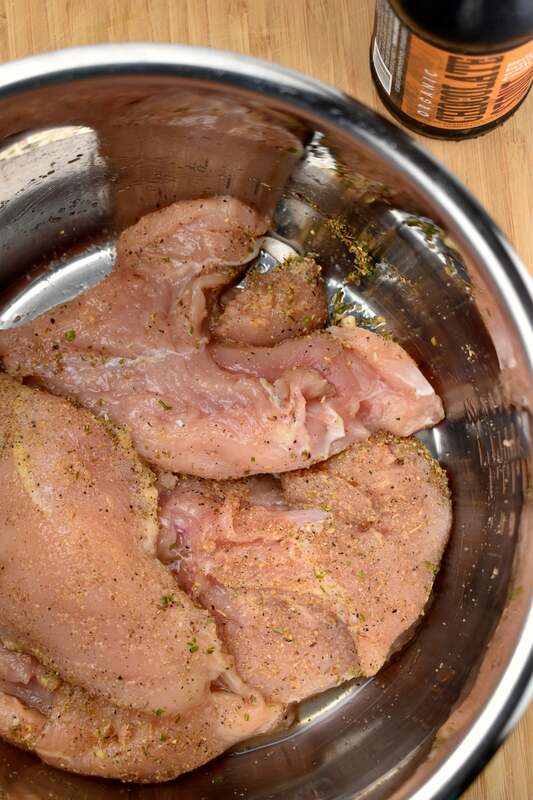 I like to add garlic powder, oregano and black pepper to my chicken. It seems to be the combination that adds the most flavor but is still mild enough to be paired with nearly everything else. But you can definitely play around with the spices. Use onion powder and paprika, or sprinkle in some Italian seasoning. Get creative! 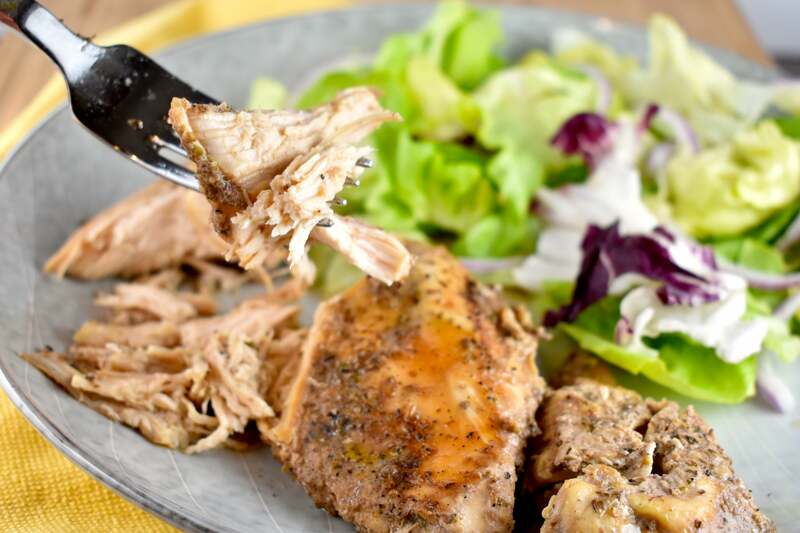 Using chicken breast in this Crockpot Beer Chicken Recipe ensures that it stays low in points, so you can pair it with just about anything – a baked potato, roasted potato skins, wild rice, roasted veggies or a tossed salad. It’s quick and easy to put together and is perfect for a busy night or that Super Bowl Sunday. A wonderful and easy Chicken Crock Pot Recipe that tastes great and has just 3 Points. 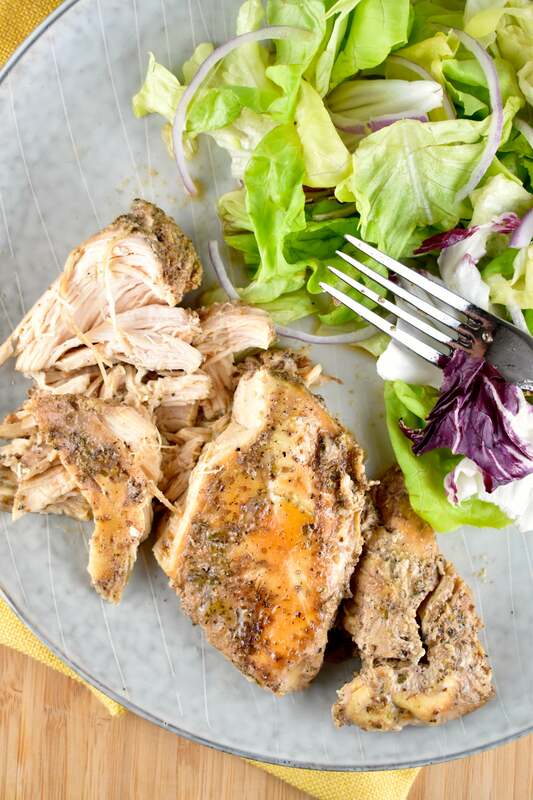 This Slow Cooker Beer Chicken also makes a great Weight Watchers Super Bowl Recipe idea. I made this once, and when I got home from work the crockpot was still plugged in but it was on the back porch. I knew immediately when I opened the door why my roomie had placed it outside after he got home before me. The smell was horrendous, no words can describe it but I’ll try: Take a wild North Korean dog, skin it, leave the tail on, add some kimchi and cat urine, then heat it for 2 days. Try Clean Print as as add on to Google. I made this and it turned out dry, I know the Beer cooks off but we both could still taste it. I really wanted to like it too. Skinless breast is always dry and tasteless. Use chicken thighs with bone and skin. If you don’t eat the skin, you’ll be left with a moist flavorful meal that’s fit to eat. It won’t add significantly more fat or calories. I go to use your “green” or “environmentally friendly” print recipe button…. 18 pages later!!!!!!!! Like what the?!?! Where is the print recipe button for just the recipe and not the other 17 pages now wasted, using your green printer friendly icon?! What a joke!! And not to mention the paper and printer ink cost!!! I just made this and it turned out wonderful… NOT dry at all. I used 2.5 lbs of frozen chicken breast and a 16 ounce can of Leinenkugel’s Summer Shandy. I used basil instead of oregano as I didn’t have any oregano on hand. I also added parsley flakes and thyme. I didn’t measure my seasoning but am sure I used more than what was called for. The chicken was very flavorful and moist. I served it with rice and veggies for a great healthy meal! I tried this with a few improvisations, I added a can of condensed cream of mushroom soup, a jar of pearl onions, and I used basil instead of oregano (didn’t have any oregano at the time). I used some larger chicken breasts so I only put in 6 of them, I ised a bottle of Corona Extra. It came out amazing!!!!! 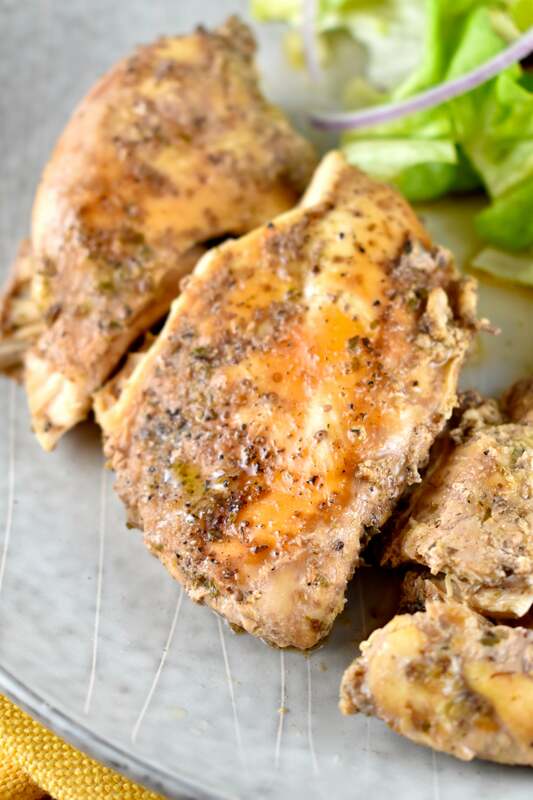 I absolutely loved the taste, the chicken is moist and flavorful! I am definitely going to be adding some cornstarch to thicken up the juice into a gravy. Crock beer chicken- hideous. Cannot believe I wasted 2# chicken on this recipe. Useless. Boiled chicken is all it is. I agree…..I wondered about using so much oregano…1 Tbsp? It was so overbearing, Ruined my Sunday dinner. No idea why this has so many negative reviews. Mine was moist and flavorful, not dry and bland like many of you commented. I used about 3 lbs. (8 boneless, skinless breasts), and a 12 oz. bottle of Shiner Bock beer. I kept the seasonings the same, but probably used more than directed, as I did not measure. Cooked on high for 4 hours, shredded the chicken, and served it over brown rice with a side of roasted broccoli. Instead of making a gravy as some suggested, I just spooned the juice over the chicken and rice on our plates to keep it low calorie. There was PLENTY of juice. No idea why anyone’s would come out dry. I made this today and it’s almost done but the chicken breasts are white. Where does the golden brown happen? And why does everyone talk about shredding the chicken. That’s not in the receipe or the picture? Cooked on high for 5 hours today, and I poked some holes in the chicken while it was cooking. Still came out pretty dry and bland. I will cut the chicken breasts up next time. I wonder, would adding corn starch thicken up the juice? I loved the flavor, but it’d be much better as a sauce instead of a juice. But yeah, it’s horribly dry. VERY DISAPPOINTING! I saw this pinned on Pinterest and looked forward to doing it. It was typical mushy, bland crock-pot chicken. I feel like I wasted good Guinness on this. If I were to re-vamp the recipe then I might oven braze with a LOT more aromatics or even use Guinness in a marinade and then grill. 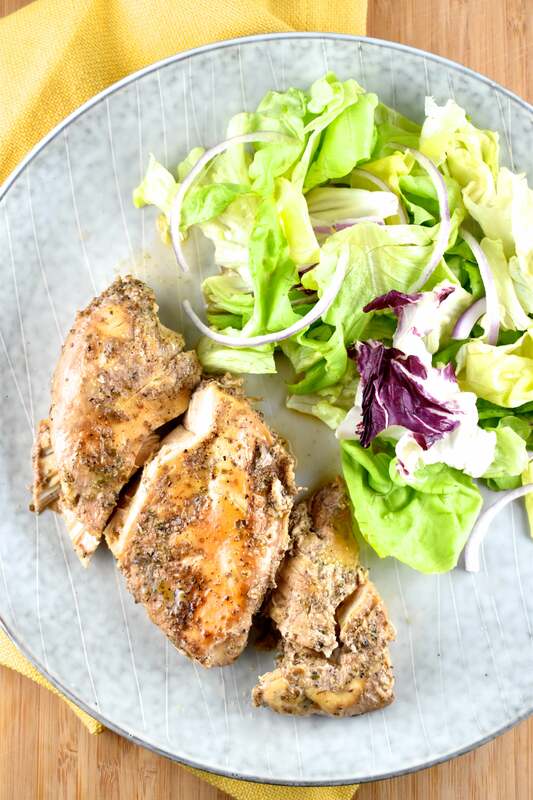 I gave this a shot, with some changes after reading the comments – I used a combo of bone-in legs and thighs, browned them nicely along with some olive oil, 10 cloves of fresh garlic, shallots, before putting in the crock pot and changed the spices to 1/2 tsp oregano, 1/2 tsp thyme, 1/4 tsp red chili flakes, and a little salt and lemon pepper. Cooked on low for 6 hours. It was fantastic. I used Lagunitas IPA, will not be using this again as it does make the dish more bitter, next time will use Newcastle or a brown ale, I think. I thought this was great! Read my full review on my blog! Thanks! Wow I can’t believe the bad feed-back on this recipe! I have made this several times and my family loves it! It’s a perfect recipe for shredded chicken. I use it as my taco meat. I also will add BBQ sauce to the leftovers and it’s great for BBQ chicken pizza or on salads, over rice! I love this recipe! I wish I would have read the reviews before making this. It looks and smells wonderful. Extremely bland and mushy even after I put on additional spices. Will not make again. Made this tonight and after reading the reviews was leary. Went on low for lil over 2 hours and then put on grill w barbecue sauce. YUMMY!!! This is amazing. Ridiculously juicy. I made this but when the chicken was fully cooked I transferred it (just the chicken none of the liquid) to a baking pan and brushed each piece with BBQ sauce then put it under the broiler for 5 to 10 minutes to cook the sauce and it was amazing. There were no leftovers. This recipe is awful. The picture with this article is very deceiving. I made this tonight following the recipe exactly and had boiled soft chicken sitting in a bath of cooked beer. It SMELLED good, but was EXTREMELY bland. I’m gonna have to get crafty to use up all the leftovers I now have. Total waste and I’m bummed. I agree, inedible! I cook a lot, and make some amazing recipes, but this was dry, bland and tasted like chicken boiled in beer. I think the real problem is the chicken itself. Modern day poultry just doesn’t taste like the chicken i ate as a kid way back in the 20th century. The only people that can get flavor into chicken these days are the guys at KFC! Absolutely awful. I made this exactly as directed and couldn’t have been more disappointed. My husband said this is he best chicken he has ever had! I used Sam Adams Light and cooked on high 4 hours. Sides were Greek Salad and beer bread. Going to make this tonight. I read all comments and can’t wait to see if mine turns out! Just looking for something simple and i make beer can chicken all the time!! Wish me luck! Please share recipes as I’m the head cook, and I’m just getting started. This was meh. I do think it would be better if you brown the chicken beforehand. Will not make again. I’m not a fan of beer at all, but my aunt makes tasty beer BBQ in the summer so I thought I’d give it a try. My aunt says cheap beer is the best to cook with because it has the most flavor. I couldn’t bring myself to be seen buying bargain basement beer so I ended up stopping at a local gas station and getting a large bottle of Heineken. The recipe doesn’t say how much beer to use, so I bought the 22oz bottle. I added fresh minced garlic, potatoes and mushrooms. I also used 2 chicken breasts and two drumsticks instead of all those chicken breasts since I was only cooking for two plus leftovers. I think the chicken came out moist because of this modification. Towards the 6.5 hr mark I added egg noodles and turned it into a meal. I shredded the chicken and the noodles soaked up all the remaining liquid. The result was amazing. I actually went back for seconds, which I never do. The picture definitely doesn’t reflect the end result. All in all, I highly recommend this recipe. Very disappointing! No clue how to pictured version is browned–you can’t really brown meat in the crockpot. I used 4 large breasts, followed recipe and it was cooked, fall apart chicken laying in juice, pretty boring. Since it did fall apart I think I’ll shred, mix with BBQ sauce, & eat on rolls. I only used three large frozen chicken breasts (equaled about 1.75lbs) and the chicken came out so juicy and brown (used guinness). Cooked it for 4.5hrs. If you don’t like oregano, I would half the amount. I have made chicken breasts in the crock pot that come out with this weird texture of grainy mush, but found out if you put the chicken in frozen, you get the right result. I would definitely make this again!! I just made this and it was so stinkin’ delicious. I did, however, half this recipe since it’s just me and my hubby. I DID NOT half the beer though. I think this is why my chicken wasn’t dry. 4 chicken breasts and one bottle of beer. So if you use 8 chicken breasts I would use two bottles or cans of beer. The beer I used was Pipeline Porter by Kona Brewing Co. A dark, rich beer with coffee undertones. OMG so good. This was delicious and I will definitely be making it again! I have made this two times. Once using skinless bone-in chicken thighs seasoned with salt, pepper and garlic salt which I marinated in the refrigerator for an hour and combined in the crock pot with a teaspoon of dried oregano, a can of chicken broth and the juice of a lemon as well as the beer. The second time I used skinless, bone-in chicken thighs seasoned with salt, pepper and garlic salt which I marinated in the refrigerator for an hour and combined in the crock pot with a can of chicken broth, one large chopped onion and five sprigs of fresh thyme and the beer. Both times, this dish came out perfectly. I like to serve this with rice cooked in seasoned chicken broth. It is pure comfort food. Oh dear, it looks so good and crunchy. I like dry chicken but after reading the reviews not sure I want to make this. Is there a way to get the chicken crunchy looking like in the photo? Possibly putting it under the broiler for a couple of minutes after it’s done? I’ve made this with Guinness, Shipyard Pumpkin, and Budweiser. Delicious each time. I usually do 4-5 chicken breasts instead of 8. All I got was boiled chicken drowning in beer. Followed exact directions. Now I have to go BBQ it to get it brown. What a waste of good chicken. This was one of the worst meals I’ve ever made. I followed the recipe, and it tasted awful. Cross this one off the list – I’ll never make it again. A total waste of time and money. Wish I’d read this before I wasted the time and a chicken’s life. Perhaps the worst meal I’ve ever made! Ok, so I read the comments and I’m sorry for those who had dry chicken, but mine was fabulous! I used 5 large, frozen, Tyson breast and one bottle of Yuenling (sp) Lagar with garlic powder (lots) & oregano. I did what one person suggested and started it on high for one hour and then on low. I ran errands for about 4 hours and arrived home at dinner time. Chicken cooked 5 hours total. I bought hot side dishes while I was out. I’ll definitely make again. Thanks! This was terrible. Way too much oregano flavor. Chicken was dry. Won’t do this again. I was thinking of a chicken crock pot meal (cause I’m tired of potroast, love it, just want something new) and seen this idea about chicken in beer in the crockpot. I love the idea, but with all the comments, I sure don’t want to go wrong. All I have is Budweiser, 2-3 bottles of. It’s my stepdad’s, but I don’t mind drinking it either. I prefer Blue Moon, or Amber Bock, neither are on hand. How would BW turn out? I thought of using potatoes, baby carrots, peas, corn, cream of celery (or C.o.Chicken), diced tomatoes, and maybe lemon juice (or something sweat, sliced lemons, oranges, cherries or pineapples)… but I never made a recipe like this before, so I don’t know how this would turn out. I’m not much of a Chef, so I don’t know how I’d put it all together, concerning proportions and cook time, and I have a 6 or 8 quart cooker… I think. Not labeled, Idk for sure, but it’s big. Be feeding a family of 5-6, with 3 kids, big appetites. Any suggested comments would be great. Opinions, for or against the idea, will be duelly noted. Will let you guys know the final meal and result. I made this using bone in chicken thighs, but I took the skin off. I used Guinness, 4 cloves of fresh garlic, 1/4 teaspoon of chilli flakes and 2 teaspoons of mixed French herbs. After the chicken was done I took it off the bone and added water and chicken Bisto to make gravy and then served it over mashed potatoes for the non-dieters and sautéed cabbage for myself (the dieter). We all loved it and the flavour was fabulous! 1. 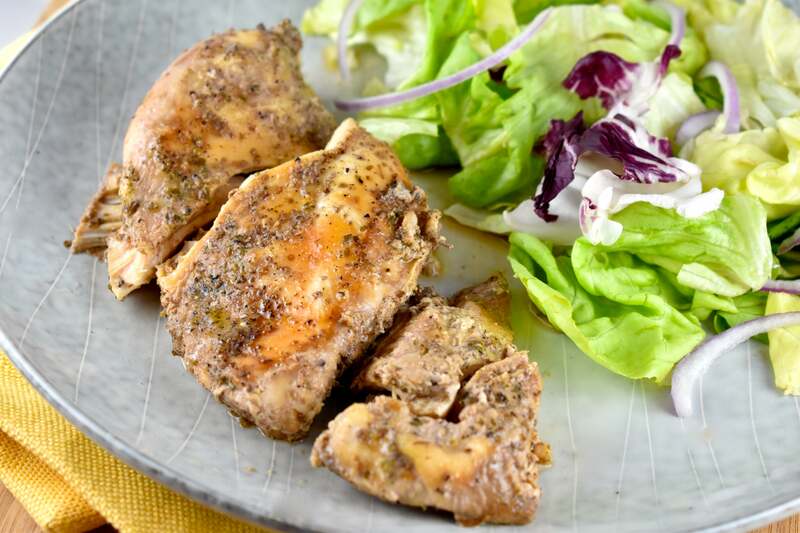 Use skin-on, bone-in chicken thighs instead of skinless, boneless chicken breasts. You can remove the skin, bones, and fat after the chicken is cooked. 2. Cut up vegetables (as if you were making pot roast) and place them in the crock pot with the beer first. They will take longer to cook than the chicken (especially if you use potatoes). 3. Season and brown the chicken in a skillet before placing in it a crock pot. 4. Start checking the chicken for doneness after 2 hours. Add the herbs when the chicken is almost done. 5. Use the leftover broth to make a gravy for the chicken and vegetables. Unfortunately I had a REALLY BAD result with this recipe. I followed it to the T and cooked it EXACTLY as instructed and the result was soooooo dry that my family didn’t eat more than a bite (I am not a meat eater, but my husband and son are). I bought 2 pounds of organic chicken breasts and that set me back $18. Major bummer. We have done this on the grill. It is awesome. Looking forward to trying it in the crock pot. Tried this recipe and it blew the lid off the crock pot… Literally, the pressure from the beer blew the lid off and across the countertop. Chicken looked like it had been drowned, and was all wrinkly. It looked nothing like the photo above. Will never cook this again!!! This turned out great! But in my fashion, I made a few changes that may have made a difference. I only used 5 chicken breasts instead of 8. I used Cayenne Pepper instead of Black Pepper, and all the other spices I did to taste–so way more than 1 tsp the recipe called for. Having done Crock Pot cooking in the past, you need to over do on certain spices in order for them to not get lost. Or do what someone else suggested, and add spices an hour before the end of cooking time–but that kind of defeats the point of putting it in the pot and forgetting about it. I happened to have a leftover can of Guinness (go figure), so I used it–but only about 3/4 since I reduced the number of breasts. I set the Crock Pot on low for about 1.5 hours, then switched it to high for the last three; so all-in-all, I only did 4.5 hours. The breasts were tender and succulent, and VERY flavorful. I also used the gentleman’s recommendation of creating a gravy from the broth, which just added a nice touch. Served it with Quinoa and mixed vegetables. Happy eating! I made this last night and it was YUMMY! I used 4 mostly-frozen chicken breasts (huge ones), 2 bottles of Coors Light, a heaping tsp of salt (and some extra sprinkled over the top of each breast), a full tsp of black pepper, a heaping tbsp of garlic powder (cuz we love garlic), a heaping tbsp of dried oregano leaves, one small diced onion. I put all of the ingredients in before the chicken and then ladled the mixture over top of the breasts once they were in the pot. I cooked everything for an hour on High to make sure the breasts thawed, then I turned it down to Low. I cooked it all for 8 hours total (1 on high, 7 on low). There was SO much liquid that at the 6 hour mark I took some out and kept it to add back in if things got too dry. I checked it every half hour then but had no problems. At the 7 hour mark, I turned the breasts over and ladled the juice on top of them. I checked every hour or so to make sure they weren’t getting dry. Used a knife and fork to open one up and slice out a tiny piece for tasting. Once done, served with rice. The meat was SOOO juicy and flavourful!! Highly recommended. Wish I had read all these comments first. . Chicken was overlooked and bland. Would not make it again.. I even added carrots then peas at the end. delicious, thanks for the recipe! I also made a gravy out of my leftover ‘broth’. How would I go about figuring out those points? I made this tonight for the first time. It was outstanding! I used Guinness and only cooked it for 6 1/2 hours on low (any longer and I think it would have been dry). That Guinness gravy idea is genius! Will try that next time! Also, hubby thought it might be good with a little lemon juice added in for a citrus kick. A+ from me! 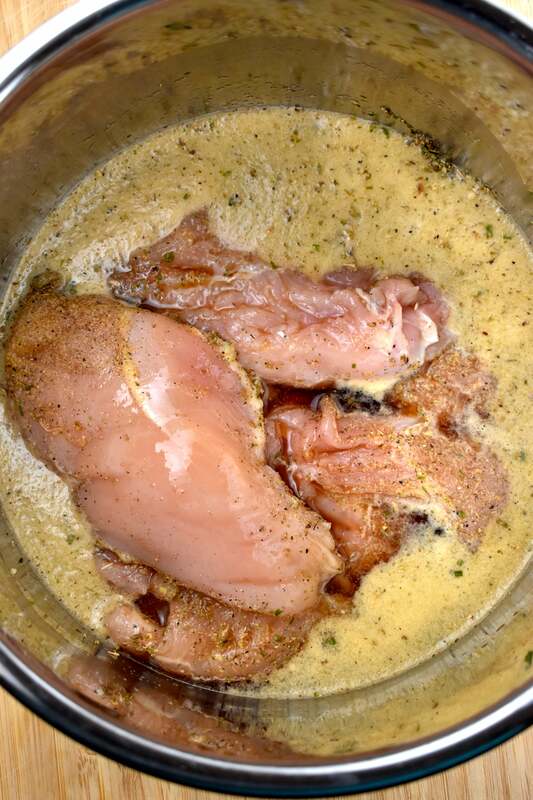 To get the browning as in the picture above, you could take the chicken out while making the gravy or sides and place under the broiler for a couple minutes (remember to baste before or you will dry it out), just to brown the outside…. I used Guinness (as suggested) NOT a good choice for us. Won’t be making this again. The chicken was fall apart tender, but the taste was way too bitter. get redbridge beer. i’m gluten free as well and redbridge is a “dark” beer and would probably work well! I used Blue Moon Pale Ale, the seasonings from the recipe along with Mrs. Dash salt free table seasoning and some red pepper flakes and served it with sweet potatoe hash browns, so delicious. Thank you for the recipe. I cooked my chicken on low for 3 hours in my crock pot and it came out slightly dry. I recommend cooking on a low heat and checking the meat for readiness after 2 hrs. Certainly not a recipe I would leave unattended for 6 hrs while at work. This was pretty bland and the chicken was dry.. I cooked it at low and it was done within 3-4 hours– I then turned it down to warm because it would have been way over cooked. I even put a little extra seasoning and it was still bland :/ if I make it again, I will use thighs instead of breasts. This was horrible! My chicken turned into jerkey and wasn’t even a little bit edible. I may try it again with a shorter cooking time but I kind of doubt it. I followed the recipe to the letter and even used a very trustworthy crock pot so I’m not sure what happened but I did not have good results and ended up throwing the entire thing away. Recipe sounds very good, but someone mentioned they can’t see how the chicken can brown while seeping in beer. I’m wondering the same thing. Does the chicken, the way you gave the instructions, come out moist? Great question! The browned bits are just the spices I coated the chicken with, which blackened when cooking. Other than that, yes, it is just plain, skinless boneless chicken breast. The long cook in the beer helped to keep in tender and moist. No, that can’t possibly be the spices that are the “browned bits” as it only uses garlic powder and some dried oregano, plus salt/pepper. Mine had no color at all, was dry as a bone and the sauce after thickening was bland also. I followed the recipe to the letter, used a good beer and still it didn’t look like this! I subscribe to your blog and resent being told that this picture is from that recipe!! I may have to unsubscribe! Sorry for being so nasty, but I think you need to look at this picture and recipe again! K=I made this last night!! Really good! Thank you so much for the recipe. I followed the recipe except I used thigh meat instead. Came out so moist and actually, it looked like the picture!! I think next time I make it, I am goign to try garlic salt too! Awesome chicken. I used Guinness as as suggested. It was a hit with my guests. I used a whole chicken. Easy and tasty. Makes wonderful left overs with the balance shredded and used or tacos with the corn relish. Does the chicken have a strong beer taste? Mine didn’t, and I used Guinness, which is a strong beer. All the alcohol cooks off, so the remaining taste is beautifully mild. Tried this last night. I followed the recipe, with these exceptions: used Bud instead of Guiness (Bud was what I had on hand); added 1/2 C chopped onions and a chopped carrot; used chicken leg quarters instead of breasts. The texture of the chicken was good, and the aroma of this dish cooking all day was great! However, it tasted bland, and if I were going to make it again, I would follow the reader suggestion to add the spices towards the end of the cooking not the beginning. The crockpot cooking method also results in a lot of broth, and it would be good if the recipe had some way of converting that to a sauce and then incorporating the sauce into the final dish. Came out bland? You used Bud, what did you expect…? Not trying to be rude, but I mean, really, it’s bizarre to think any American light lager is going to contribute much, if any, flavor. Has anyone tried this while a whole chicken? I did, very tasty, delish!! except for the amount of grease from the skin, had to remove a lot of the fat next day, lots of gravy Made curry with leftovers. Made with thigh meat and recipe was to die for. Also added mushrooms and parsnips made very good flavor dusted the top with powdered chicken broth for an added kick! Five stars!!!…. Made this for dinner tonight… I added some minced garlic (no garlic powder to be found when I went to get it). Plain old yuengling light for the beer, and some other spices. Cooked on low from 9-5, and since I knew it’d be in a while, I added a bit of chicken broth I had in the fridge. Thanks so much for the recipe, because wow is this tasty! Almost no effort on the front end, and a wonderful dinner when we all got home from work and afterschool activities! Yum & thanks! Never add herbs and/or spices to a crock pot until about an hour or so before the end of the cooking time. If you put them in before that the meal (any crock pot meal) will be bland. Beer left over from the 4th of July? I don’t even have beer left over from Columbus Day (yesterday). Although I am a little late for this post, I thought…hmmm, I don’t even have beer left over on the 5th of July! Thanks @hongryhawg:disqus for the laugh this morning! Ok, so I wouldn’t recommend this for a “cook while you’re at work” dish. I also wouldn’t recommend it iwth breast meat. Though my pot shut off at the prescribed time, I came home to dry chicken with a very strange texture. The flavor was ok, but, for chicken that basically braised (sat in liquid) for 8 hours, it was almost inedibly dry. I”m going to try it again with bone-in thighs and less cook time and see if that helps. My chicken was terribly dry as well… Had to choke it down. Very disappointed since it smelled so good cooking! Tossing this recipe! It’s because 6 hours is way too long to cook any chicken in the crock pot. I’ve made so many crock pot recipes, and they all usually take 4 hours. So, your chicken was dry because it was overcooked. This is in the crockpot right now! I added a few spices and used Shiner Bock, our fave household beer. :) Can’t wait to see how it turns out. Love fix it and forget it meals on junior high football game nights. I made this this this morning and used coors light (it is all we had, haha) hope it is just as good as you all are saying. !! I made this in the crock pot and used frozen chicken breasts. I added another half a can of beer because it was on low for 10 hours and I was worried it would dry up. It was too much beer. I recommend only one can if you are using frozen. It was very good and I will definitely make it again, just with less beer! Was this in a 6 quart slow-cooker? If so, how much room was leftover for veggies then? I want to try & make this with maybe baby red potatoes or diced sweet potatoes (maybe even Yukon golds if small sized), baby carrots, celery, corn, & peas. I’m thinking maybe add the veggies in about 90 mins. prior to serving? Think that would be long enough? They’ll be canned peas & corn & the rest of the veggies would be fresh, not frozen. Yes, this was in a 6 quart slow cooker. There was plenty of room for veggies, but depending on how many you add, you may need to use some extra beer. Choose a firm robust potato like whole or halved small red potatoes; they should hold up better with the longer cooking times. By a bit, but not too much. Just check the chicken, and as soon as it cooked through and gets to the point of falling apart, then it’s ready. Thanks! I actually ended up getting three boneless/skinless breasts, but they were huge- total of 2.61 lbs! They were done after about 3 hrs 15 min on high, put them on low while I made sides. The gravy idea someone mentioned earlier was very good! I put about 1 1/2 Tbs of cornstarch, brought to a boil, then simmered for a few minutes, and poured it over the chicken and also the mashed taters. Delicious, thanks! Warning: possible dumb question ahead…..I want to make this tomorrow, but the chicken would most likely be in the crock for about 12 hours before dinner. Do you recommend then to throw it in frozen or will thawed be fine on low for 12 hours? As it might be in for that length of time, would you also recommend more beer to keep it moist or would 1 bottle still be sufficient? GREAT question! I haven’t tried leaving it in that long myself, but I would def use some extra beer…maybe another half bottle. And I think using the frozen chicken would help a bit too. Let us know how it goes!! I liked the chicken, but the oregano was overpowering… next time I’m gonna experiment with the spices… I’m thinking rosemary instead of oregano. The bacon mashed potato side dish was a hit and sprinkling some cheddar was delish, but the corn salad is really more like salsa and we are gonna eat it with chips instead. Agreed. The oregano is way too powerful. Don’t think a tablespoon is needed. Maybe 1/2 a tsp. Thinking more garlic, pepper, a little kick of lemon pepper or even some chicken grill seasonings. What kinds of veggies could i put in here with out them getting mushy also could I cook potatoes right in there with the chicken like you do with a pot roast or will it make them taste funny?? Any root veg should hold up well. Potatoes should be fine too, unless they cook too long. Do you start with thawed or frozen chicken breasts? I need to make for the weekend. Thanks! I used thawed, but haven’t tried frozen, so I don’t know if that would work or not. One thing you have to keep in mind when using frozen meet in the crock pot is you will have more liquid as the meat thaws, so may want to add less liquid initially. Does the chicken need to be thawed before putting in the crockpot? I also used Newcastle….double delicious. I added two Texas style sausages to the recipe for additional flavor and served the chicken with sliced sausage…..enjoyed by all. My chicken was done in 3 hours. Some slight differences in what I did…1st chicken breast only had 3 were frozen, so started 1st hour on high then went to low setting. Is the fact that I had less chicken the reason for a faster cooking time…new to crock pot cooking. I have a 6 qt Revel crock pot if it matters. I made this for the family today and it was so yummy! I used Guiness (Guiness makes everything better) and the same seasonings in the recipe. When the chicken was done, I removed most of the “broth” and put it in a small sauce pan and thickened it up with a cornstarch slurry. Then I poured the “gravy” back over the chicken and kept it warm until we were ready to eat. Served it over mashed potatoes. Definitely will make this dish again. Thanks for sharing it! Mmmmmmm!!! LOVE LOVE LOVE the Guiness gravy idea!! Fantastic. Thanks so much for sharing. Me + Guinness = BFF. Any idea of Points for the gravy? If you add the corn starch that is just an extra 60 calories for 2 tablespoons, I figured out calories, not points because I don’t do weight watchers, I do 5:2, and it came out to 250 calories per serving using 10 skinless, but bone in, chicken thighs and a can of Guinness. Just discovered your site. Awesome recipes! Thank you so much. And thanks for including gluten free stuff. I am going to make this one with gluten free beer. How does the chicken get so nice and brown, as in the picture? Also, could you use boneless skinless thighs, and how much would that increase the point value? Thanks! The color of the chicken will depend on the kind of beer you use. I used Guinness, which is very dark. It was sooooo yummy! If you use thighs, the Points + value will probably increase by a Point or two. Very disappointed with the recipe. My chicken looked had no color whatsoever…….looked nothing like the photo. How can it possibly brown while floating in beer? I also agree with another poster who said the amount of oregano was way to much. I ended up removing as much of it as I could from the chicken pieces and made chicken salad. You don’t have to worry about giving it to kids, the alcohol with boil off. I cook with beer in my crockpot all the time.